New high-def camera used to make rocket plume footage. Top: Rocket plume from the test using normal video. Bottom: The test using the new HDR camera. On June 28, NASA test-fired a solid rocket booster being built for its Space Launch System rocket. The test went well … but it wasn’t the only thing being tested. The camera, called NASA’s High Dynamic Range Stereo X (or HiDyRS-X), uses a variation on high dynamic range processing. HDR pictures, when done in the standard way (like in many phone cameras), can show a broader range of brightness. Instead of taking a single picture, the camera takes several at different exposures, then uses software to analyze the images and creates a composite that takes the brightest parts of the scene and uses the shortest exposure for them, while using the longer exposures for fainter parts. When combined, everything looks exposed correctly. This won’t work for video, at least not easily. Taking multiple exposures takes time, and if you’re trying to see something that moves quickly—like a rocket plume—that’s a problem! This is where the new camera is very clever: it uses onboard technology that exposes each individual pixel separately, so that bright and faint parts of the shot are balanced in each individual video frame. The results are stunning. 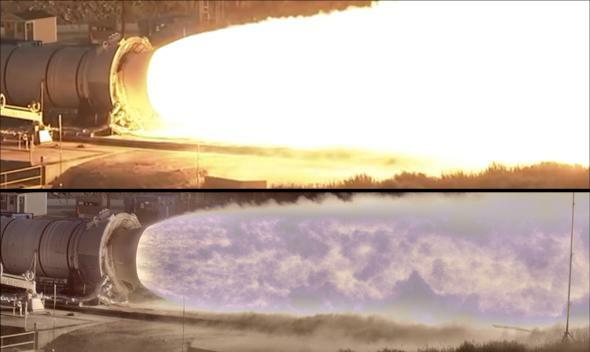 A normal video camera shows the rocket plume as being hugely overexposed compared with, say, the engine nozzle (see the image at the top of this article). But in the HiDyRS-X video you can easily see both, allowing for accurate tracing of plume dynamics, which is critical if you want to understand how the rocket engineering affects the thrust. While I am no fan of the SLS (to say the least), I am still mightily impressed with this footage. A camera like this will be massively useful not just for NASA but in many other applications. In fact it was NASA that helped it get developed; it was created by engineer Howard Conyers under the auspices of the Big Idea Challenge, a design competition looking for innovative, game-changing ideas. It looks like they found a good one here. Tip o’ the lens cap to Fark.